Maybe there is no nicer cinema in Vienna (apart from Gartenbaukino and Künstlerhauskino) than Filmcasino. It all started in 1911 as a Kinematographentheatre, turned into a cinema later which luckily escaped from being completely destroyed in 1946. 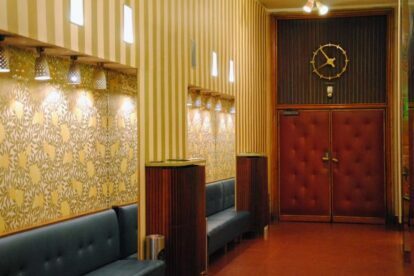 The interior you will surely admire, it is from the 1950’s, with a restoration done in 1989. Once you enter the cinema you are in some kind of time warp. Wooden panels on the walls, old sofa/benches and couches, beautiful lamps, mirrors and wall paper. There is only one big show room with a (newly made, but stunning) ornamented ceiling. The chairs are comfy, the screen is huge, the audience mixed with loads of committed cinema-lovers and the programme is great (with films very often shown in original language with subtitles). So what else do you need to be called one of the nicest cinemas in Vienna? Check out the website, as there are often very interesting small film festivals taking part in filmcasino – e.g. latin movie film festival or queer film festivals.